Wow what a Summer it has been! Our team has been busier than ever racing in the UK and Med, and supplying new sails to some fantastic boats that have been achieving great results. We’ve been making sails in some of the finest materials and designing sails with speed in mind. The newly expanded Cowes loft has the widest wooden beamed span in the country and is a great pillar-free space for lofting the sails we make. Invariably a colourful spinnaker is taking up the floor to brighten up the loft. Ratsey and Lapthorn were proud sponsors of the third Hamble Classics Regatta hosted by the Royal Southern Yacht Club in September. A great success with a number of Ratsey and Lapthorn customers on the various start lines. Giovanni Belgrano’s classic Laurent Giles designed: Whooper in IRC1 again proved her speed winning her class. One of our favourite customers, we are delighted to be continuing to build sails for this great team this Autumn in our loft in Cowes. In the large gaff rigged class our sails dominated the first three boats with Ivy Green coming out on top. Peggy Bawn and Thalia were close behind and all three boats looked fantastic with their full suits of Ratsey and Lapthorn sails. 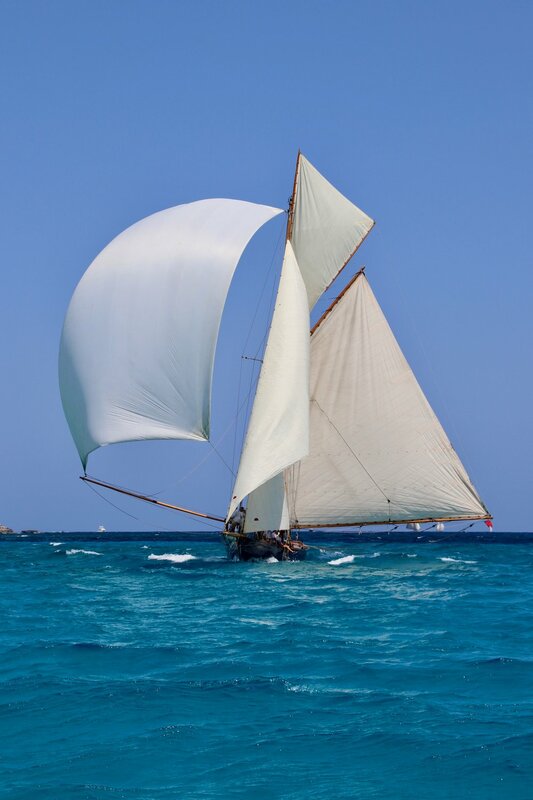 Another vessel flying a complete suit of our sails was owner Nik Kidds Nicholson designed, Xyris Class 30ft Bermudan sloop, Ampere. Scoring an impressive first place in the second race she was going really well. In fact she looked so good she even won the Concours d’Elegance Ultimate Condition prize. Congratulations Nik. Also winning Concours d'Authenticité condition and originality was Peggy Bawn - 1896 G.L. Watson designed Gaff Cutter with aforementioned Ratsey Suit. Well done to owner Hal Sisk. Another great weekend of racing and we very much enjoyed spotting so many of our iconic red logos on so many different types of small ships sails out on the Solent. Marigan with her new headsails, raced in the Club de Mar-Mallorca's Classic, her second regatta, held in Palma Bay during August. The biggest entry on record, which included some of the best Yachts in the Med circuit including Moonbeam IV. When Marigan came to us she needed 4 new headsails, we managed to completely re-design her sails from the old hand-drawn designs from 14yrs ago. Using new sail design software we built her new sails made from the best Dacron fabric (contender Fibercon Pro, Low aspect) and finished them with the best traditional skills of the Ratsey and Lapthorn team. Dont forget to book in to either of our offices in Cowes and Mallorca for your Winter service, to ensure the best care to your sails ensuring they’ll be in best condition for next season and helping to have a long life aboard. We can offer full inspection, fresh water cleaning plus drying and storage over the wet and humid Winter, in our climate controlled facilities. We can meet you on board and dismantle your sails, or arrange to collect them wherever is convenient. We can also check with you all systems to ensure next year's sailing season will be even better.